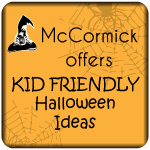 I was so excited when Kitchen PLAY contacted me to participate in their Halloween SideCar series sponsored by McCormick®. Hope you enjoy these easy and fun to make treats! Also, read until the end to find out some information about a contest you can enter. The mission: to create a kid-friendly Halloween treat. Ooh fun! The point is to have fun and create some fun treats with your kids, so feel free to use your favorite homemade cupcake recipe or use a boxed mix. Same with the icing, make it yourself or buy it. It’s completely up to you! For this project, I used McCormick Black Food Coloring. It works very well! It doesn’t take the entire bottle to dye the icing. Using 3-4 drops at a time until you get to the shade of black you’re looking for. Mix up it really well and you get this black icing. Cool, huh? I love that the McCormick® black food coloring, along with their other colors such as red which is perfect for red velvet cupcakes, works really well in cake batter as well as icing. Huge benefit, McCormick food colors don’t change the taste of the foods they are dyeing too. I used a decorator bag, coupler and a #2 tip to write RIP with the black icing. You can use a plastic zippered bag, cutting the corner after filling the bag with about 2-3 Tbsp of icing. 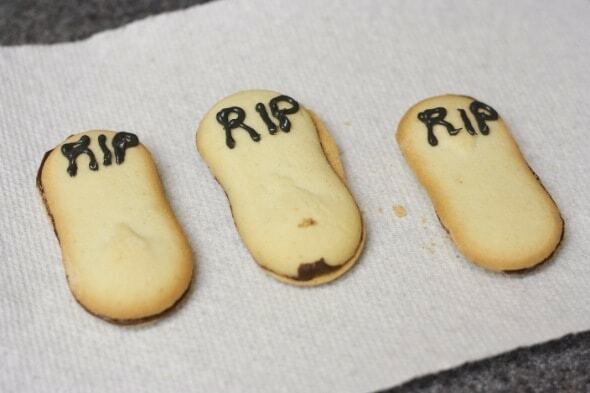 Make sure it’s a small cut and pipe out RIP on each cookie. Tip: If you don’t have cake decorating supplies, you can use a plastic zippered bag and fill it with 3-4 Tbsp of icing. Make a small opening on the bottom corner of the bag by cutting it with scissors. Make it an assembly line, pipe 3-4 cookies at a time. **Party Idea: You could use these cupcakes as favors or place markers at a party table. Pipe each child’s name on the cookie or directly on the cupcake. When you’re done piping the cookies, press them halfway into the decorated cupcakes and decorate with candy bones or sour gummy worms. I made the bones myself with a mold and melted white chocolate. I have seen hard candy bones (even with “blood” on them) in the stores lately. I was photographing the cupcakes with the bones and then remembered that I had just bought these brightly colored sour gummy worms. Perfect! **Party Idea: Make decorating cupcakes an activity at your child’s Halloween party. Set up a table with small bowls filled with sour gummy worms, white chocolate bones, chocolate sprinkles and any decorations you want. Depending on the children’s ages, you may want to ice the cupcakes ahead of time. 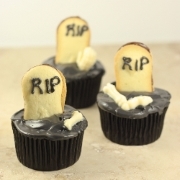 Your kids will have fun decorating their own graveyard cupcakes! (To make a box mix even more moist and delicious, I added: ½ tsp McCormick vanilla extract, ½ Tbsp espresso powder mixed with ½ cup warm water, 3.4 oz chocolate pudding mix (not instant), one extra egg that the box calls for and the same amount of oil and water the box mix calls for). Bake cupcakes in liners in a cupcake tin according to directions and allow to cool on cooling rack at least 30-60 minutes. If you're not going to ice them within 12-24 hours, be sure to cover them. Ice each cupcake with black icing. Pipe RIP or names on each oval-shaped cookie with icing a decorator bag (with coupler) with #2 tip or in a zippered plastic bag (cut the corner of the bag very small). 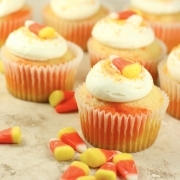 Push cookies into cupcakes halfway and decorate with your favorite candies. If your cupcake liners tend to separate from the cupcake like mine sometimes do if completely sealed, cover with thin kitchen towels and store on the counter in a cool & dry place. It's best to not add anything to the cupcake that's not edible when decorating with children. Allergic to chocolate or don't like it? Use a white cake mix. 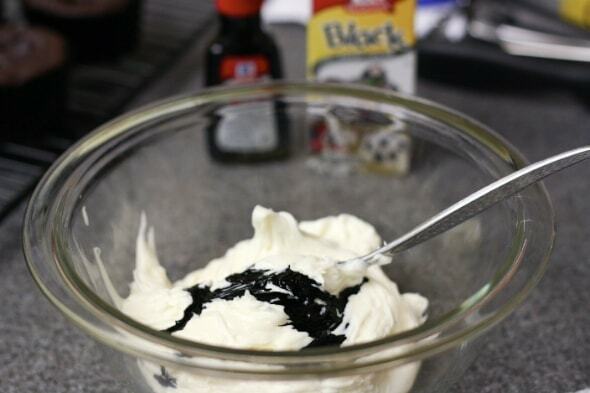 Before putting batter into the cupcake liners, dye the batter gray with McCormick black food coloring. Using a few drops at a time until you're happy with the color. McCormick is also sponsoring a wonderful giveaway at Kitchen PLAY. Simply recreate any one recipe from this month’s SideCar Series, post about the experience on your blog and provide a link to your post on Kitchen PLAY to enter. All qualifying bloggers in each course will be entered to win $50 (10 prizes total). The deadline is October 31, 2011. Please review the complete contest rules before entering. Good luck! Disclosure: I was compensated for my participation in the Kitchen-Play Halloween SideCar series. These opinions are my own and I only work with brands that I like. These are so adorable and look delicious! Milano cookies are my favorite, so I can’t imagine how much better they would be with a cupcake! Oh, I love what you came up with! Very Halloweenish, but not scary for the little ones. Nice! 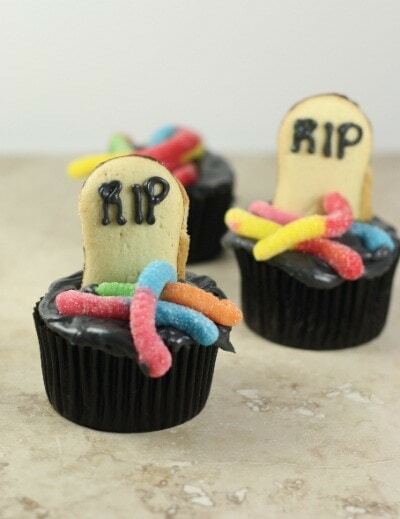 Love the use of the worms! Love your cupcakes! So cute! How cute! I love these cupcakes. those cupcakes are so cute! My girls would love them! I’ll never look at a Milano the same way again. 🙂 These are too cute! How awesome are these little cupcakes! I always want to make some thing for Halloween but can never come up with anything! Totally cute Julie! We’ve made something similar in years past and they were a huge hit. Adorable Julie. So much fun. Pinned-love it! Love those! So creative and the black icing is perfect for them and makes them really stand out. These are took cute for words and just almost too cute to eat. I thought I had my Halloween treats all set. I hought my table is all ready with all of my recipe cards all prepared…But then I stumbled upon your blog. Your cupcakes should be a part of my Halloween treats. They are really cute and easy to make. Thanks! HA! that’s frickin’ awesome and so cuuute 😀 i’ma have to try these! Oh my gosh, Milanos make the *perfect* tombstone. How adorable! These are adorable! 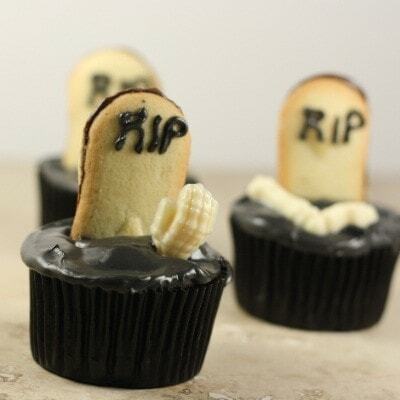 What a great idea to use Milano cookies as tombstones. These are simple and adorable! What a great way to use milano cookies. These will be perfect for Halloween parties this weekend, thanks! How did I miss these? They are too cute! Very cute! 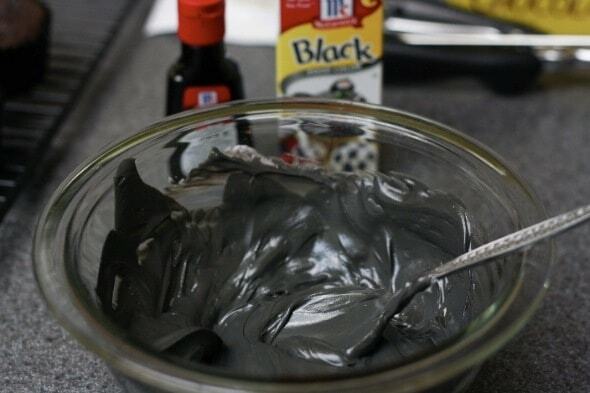 I’ve never been able to make black icing without it tasting “inky” if you know what I mean so I’m going to have to try that McCormick black food coloring. Thanks!